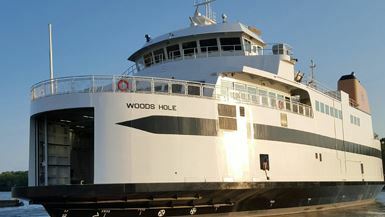 WOODS HOLE – The Steamship Authority is providing several opportunities for members of the public to view and offer feedback on revised design options for the Woods Hole terminal building. The facility will be constructed as part of the terminal reconstruction project that is currently in progress. The three design options under consideration will be presented to the Authority’s Board at its meeting scheduled for 10:00 a.m. Tuesday at the Authority’s administrative offices in Falmouth. The revised design options also will be posted on the Authority’s Woods Hole Terminal Reconstruction Project webpage, www.steamshipauthority.com/WHterminalreconstruction, following Tuesday’s Board meeting. -5 p.m. Monday, April 8, 2019 at the Katherine Cornell Theater in Tisbury Town Hall. Additionally, the public will be able to submit written comments by April 12 via email to whterminalfeedback@steamshipauthority.com or by mail to the Steamship Authority, Attn: Woods Hole Terminal Designs, 228 Palmer Avenue, Falmouth, MA 02540. Following the public sessions, the Steamship Authority and its board members will review the comments it has received and incorporate them into the decision-making process for determining the building’s design.